The Fog was my fourth feature film (sixth if you count Someone’s Watching Me and Elvis, two made-for television movies) and was meant to be an homage of sorts to H.P. Lovecraft, M.R. James and other writers of great ghost tales and the supernatural. The screenplay was written in February and March of 1979 by Debra Hill and myself. Along with Tommy Lee Wallace, the production designer and editor, Debra and I scouted various lighthouses along the coast of California and settled on the magical, moody lighthouse and surrounding windswept plains of Point Reyes National Seashore, just forty miles north of San Francisco as the setting known as Antonio Bay in the screenplay. I shot The Fog in April and May and then took a ten day vacation to Tahiti. When I returned, I rushed into the editing rooms at Samuel Goldwyn Studios to consult with Tommy Lee Wallace as to how the picture was cutting together. It was a disaster. Quite simply, the picture didn’t work. Numb with a horrifying loss of objectivity, I finished the editing and went to work on a musical score that I hoped would somehow save the picture. We dubbed The Fog in September, and finally watched the finished product. The movie I had made was clunky, clumsy and awful. The music was heavy-handed and obvious. I wanted to pack up and leave town. This was the lowest point I had come to in my professional career. With a mighty Herculean effort, Debra Hill, Tommy lee Wallace and myself re-wrote, re-cut, re-shot and re-scored the picture. In one month. I went back to Sound Arts Studio in central Los Angeles and quickly began composing and recording new tracks. Dan Wyman, my creative consultant on Assault on Precinct 13 and Halloween, was at my side programming the synthesizers, keeping a critical eye on my multi-tracked performances and maintaining quality control over the long hours of recording and mixing. And, out of all this frenzy, re-working and re-structuring, I produced what I consider to be one of my best scores. What was missing from both the movie (the first, aborted version) and it’s score – a lightness of tone, a softer understated fear – was achieved. My favorite theme is associated with Stevie Wayne (Adrienne Barbeau) as she walks down the cliff-side steps to her lighthouse/ radio station. It consisted of three lines, a high flute melody, a mid-range counterpoint and a low bass support. 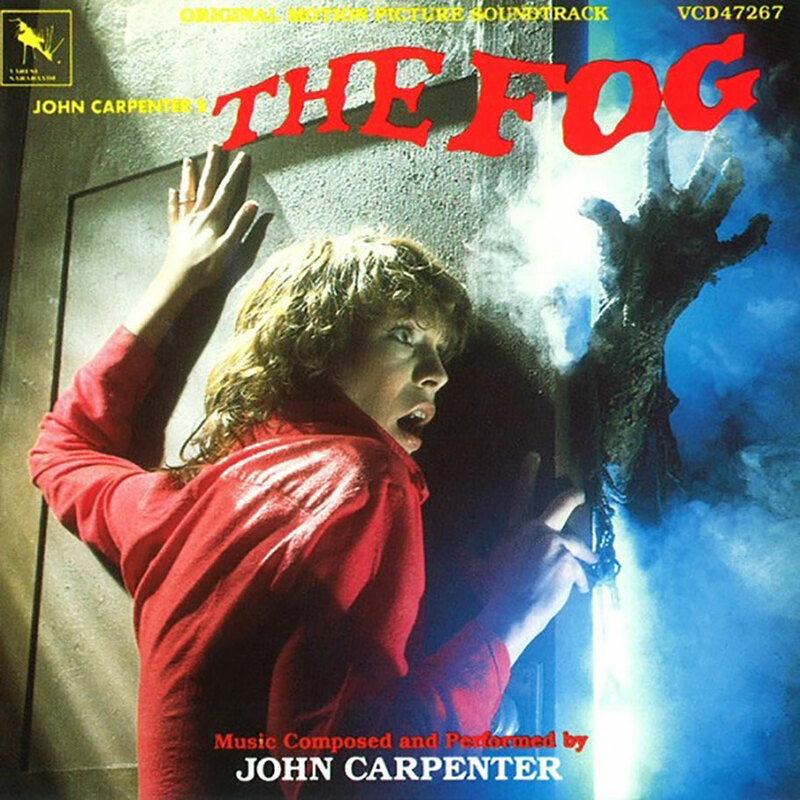 At the beginning of the second act, as Andy (Ty Mitchell) discovers a strange piece of driftwood on the rocks at Drake’s Bay, I used a bell/ harpsichord ‘round.’ Reel 9, ten minutes of elaborate chase as Tommy Atkins, Jamie Lee Curtis, Janet Leigh, Nancy Loomis, Hal Holbrook and Adrienne are trapped by the fog, was held together by an equally long piece consisting of a bell/ heartbeat driven by rising and falling synthesized tones.